We often do large photo archiving projects for families that involve scanning and creating digital records of photos albums, boxes of loose photos, newspaper articles, certificates and other family mementos that a family wants preserved. Families want this service because it provides a backup should anything happen to the original as well as a architected filing storage system that makes it simple to find any photo within minutes. If you have a large family, there is no need to argue over who gets which photo from your parents’ collection. New print sets can easily be created and shared among all family members. 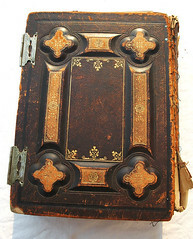 We recently did a large restoration project that involved a family bible belonging to the family’s deceased parents. It was a beautiful leather-bound bible that had a variety of themed blank pages in the back to keep notes of baptisms, confirmations and weddings as well as spaces for photographs and family notations. The family had created meticulous hand-written notations as well as included many photos and newspaper clippings of announcements and the bible had been well-worn over many years. We scanned all the these themed pages but it probably would have been a good idea to have the bible re-bound, although of course, that would only leave the one copy. The family consisted of 5 siblings each with their own families. Who would get the copy? It got me to thinking that with all the custom, on-demand book publishing services that are available these days, it would be fairly easy to create a really amazing custom family bible that could be personalized and distributed to all members of the family. Like those custom family calendars that include photos, birthdays and other pertinent information, your family bible would reflect anything that you decided was important. Text versions of the bible are already available. I found an online PDF version of the King James Bible, and while there are several versions of the Old Testament, a quick search in Google let me to multiple links where the complete text was available. Be sure whatever version you use for text is in the public domain. Unless you have some skills with design layout, you might need the assistance of a good graphic designer to help you design and layout your family bible (email me for some recommendations) but each page of text could be laid out around photographs, highlighted boxes with information about the family, information about affiliation and congregations… pretty much anything you wanted to include to personalize your bible. If anyone has done one of these or thinks this is a great idea, I’d love to hear your comments! I think you hit on an interesting idea. Not sure who’d do this as a product offering. You could maybe approach some of the Christian book publishers/sellers to see in there was interest on a larger scale. There is the consideration of printing permission for Bible versions, too. I am trying to find a digital/on demand publisher that will print one copy. That hasn’t been as much problem as page limitations. So far the largest I have found is 440 pages. I don’t know if they are counting single pages or double sided. Either way it falls 3-400 pages short of an average translation length. I am just trying to get a wide margin copy of my chosen translation because it is not available. If I find a printer who can handle the size and single quantity, I will let you know. In the meantime it seems that it might be better to make a family bible scrapbook with photos, mementos and selected favorite passages or books.